All the flavor of the original packed into the perfect handheld bite (plus a surprising secret ingredient!) 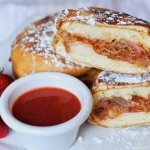 — our Mini Monte Cristo Sandwich is a guaranteed crowd-pleasing party appetizer! Slice Hawaiian buns in half. Layer each sandwich with 1 slice deli turkey, 1 slice Swiss cheese, and 2 heaping Tablespoons of Curly's Pulled Pork. Place the top bun on top of your sandwiches, and gently press the edges to "seal" contents of sandwich. Heat 3 cups of vegetable oil in a dutch oven or frying pot. While oil heats, prepare funnel cake batter according to directions on package. Using tongs, dip sandwich into funnel cake batter. Turn until sandwich is fully coated in batter, then gently place in oil. Fry for 2-3 minutes until the outside of sandwich is a light golden brown. Remove from oil and set on a paper towel-lined plate to cool. Repeat with all sandwiches. Combine strawberry jam, fresh strawberries, orange bell pepper, and habanero pepper in a food processor or blender. Chop until all ingredients are well incorporated and sauce is a smooth consistency with no large chunks.